* The NEW EM Series is a high-speed VMC with a cost savings that hammers the competition. It delivers more bang for your buck and increases your production capabilities. The series is engineered with efficiency to satisfy the need for large quantity machining. Chose from three models: EM1620L, EM2033L and EM2040L. * There is nothing sacrificed or compromised in our new EM Series. The major parts of the machine are constructed of high-quality Meehanite cast iron, which offers superior stability. The machine's base is supported by full-travel, enabling it to be suitable for high-speed machining. All three axes are built with high-speed linear ways providing smooth quick movement without delay. 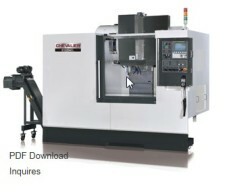 * The series provides fast interpolation, minimizing machining time with high, rapid speed, up to 1,889.7ipm. All 3-axes are driven by preloaded P3 ballscrews and super fast linear ways. The powerful 20HP spindle motor handles up to 10,000rpm, combining an attractive finish surface in high-speed with enough torque in lower rpm. Tool capacity is 24 tools with a random tool double arm tool change. * You work with the best when you own a Chevalier. More than 30 years of the industry's top R&D has produced a NEW EM Series that's the best value in VMC machining.